Long Dress with V-neck and three fourth sleeves by Cottinfab. The dress has button on the front with a high low hem and box pleat on the front. We, D S S Cottinfab Ltd., established our operations in the year 2010, as manufacturers, wholesaler, exporters of a boundless range of Ladies Garments. 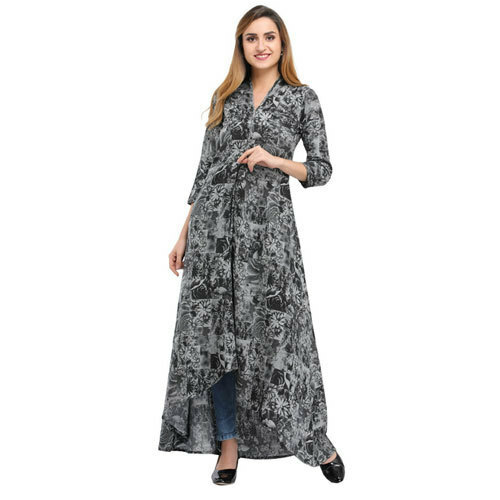 Our product assortment comprises of Ladies western wear, dresses, Jumpsuits, Designer Kurti etc and that can be availed in multiple pleasing colors, designs, patterns and sizes to fulfill the varied customer requirements. We procure quality grade fabric from our reliable and dependable vendors and tailor our product collection as per the latest market trends. It is because of the consistent efforts and hard work that we have achieved a large number of customers in the market. We have established a state-of-the-art infrastructure facility that is equipped with various advanced technology machines and equipment that support us with the obstruction free manufacture and storage of the series. To manage the infrastructure and operations, we have hired a team of professionals that understands and strives to meet the varied client demands. Owing to the colorfastness, shrink resistance, appealing designs, alluring looks and perfect fitting, the proposed collection is vastly demanded among our valuable customers in India. Our exporting countries are Europe, Singapore, USA & England.